Nothing says Valentine's Day to me more than seeing all that red and pink packaged candy in the stores. It's the first holiday of the year where you can find fun shaped treats in special packaging. This Valentine’s Day, The Hershey Company helps you share the love with all the special people in your life, with new innovations from its iconic brands. • Reese’s Pink Peanut Butter Hearts - Think “pink” and taste the perfect combination of pink creme and classic Reese’s peanut butter in a fun heart shape. These treats are individually wrapped, making them perfect for candy dishes or gifting. Available in 10.2-oz. bags (SRP $3.99). • Reese’s Peanut Butter Cup Miniatures Cane – Show those close to your heart how much you care for them with Reese’s Peanut Butter Cup Miniatures Cane with a heart shaped cane topper. Available in a 2.79-oz. bag (SRP $2.49). • Reese’s & Kit Kat® Valentine’s Exchange with Cards – Add a sweet treat when telling the special people in your life how you feel. Include either a Reese’s Peanut Butter Cup or Kit Kat® miniature, ideal for office or school Valentine’s exchanges. Available in 13.68-oz (SRP: $5.99). 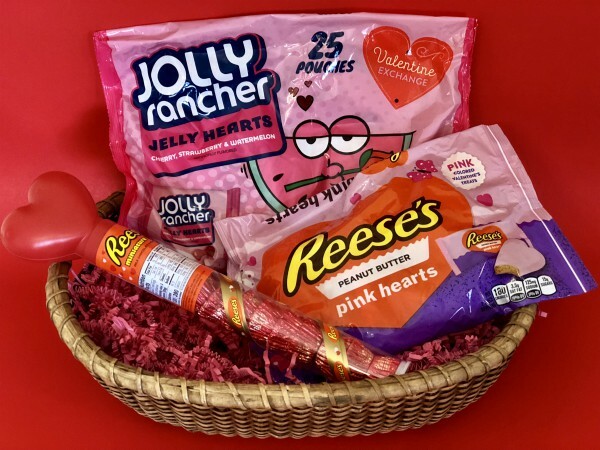 • Jolly Rancher Jelly Hearts Valentine’s Exchange – Show all the sweet hearts in your life you care with Jolly Rancher Jelly Hearts Valentine’s Exchange. Available in a 15-oz. bag with 25 pouches ready to be personalized for all your Valentine’s this season. (SRP: $5.99). Be sure to check out the Hershey's holiday website for lots of fun recipes, crafts, and holiday product information.